The Army on Tuesday said the leadership of Pakistan-backed Jaish-e-Mohammad (JeM) in Kashmir was "eliminated less than 100 hours" after the February 14 CRPF convoy attack in Pulwama and warned that those who pick up the gun will be neutralised unless they surrender. In a first joint briefing with senior officers of CRPF and Jammu and Kashmir Police, Corps Commander of the Army's 15 Corps, Lieutenant General Kanwaljeet Singh Dhillon, said, "The JeM leadership has been eliminated in the Valley in less than 100 hours since the attack." He said, "All those who pick up the gun will be eliminated unless they surrender. We were tracking the top JeM leadership since February 14 attack." 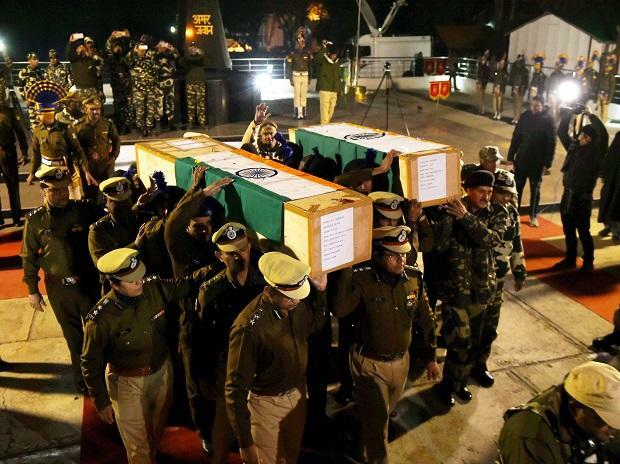 "The convoy attack was carried out by Jaish-e-Mohammad which is being controlled from Pakistan with an active support of ISI and the Pakistan Army. Top JeM commanders, most of them Pakistanis, were in-charge of controlling, coordinating, fabricating and execution of this operation," Dhillon said. Noting that the car bomb-type terror strike happened after a long time in Kashmir, the officer said the security forces will keep all options open to deal with these kinds of attacks. Responding to a question on security forces' future course of action in the wake of the convoy attack and the killing of four Army personnel, including a Major, in an encounter with terrorists on Monday, Dhillon said, "The investigation (into the CRPF vehicle attack) is at a very advance stage. We cannot share probe details right now. We have leads on the type of explosives used but I cannot share." He asserted, "We are very clear about our anti-terrorism policies. All options are open to deal with the new modus operation." The officer appealed to the youth to stay away from any gunfight site and requested the parents to keep their children away from terror activities. "I also want to tell one thing to the parents of the local youth specially mothers because I understand and I know that in Kashmiri society, the mother has a great role to play. I will request all the mothers of Kashmir to please request their sons who have joined terrorism to surrender and get back to the mainstream," he said. In the backdrop of reports that several Kashmiri students had received threats post-Pulwama terror strike, Inspector General (IG) of J-K Police SP Pani said that the students are being taken care across the country. Pani also said that many families in the Valley were playing a major role in stopping their children from getting recruited by terror groups. "There is a significant dip in recruitment...The families are playing a huge role in this. We would like to urge the families and the community to help in curtailing recruitment," he said. IG (Operations) of CRPF Zulfiquar Hasan said, "The incident happened because of an IED- laden civilian car. The Road Opening Party (ROP) had secured the highway. Now, the Standard Operating Procedure (SOP) on civilian cars will be changed." He also said, "Our helpline-14411 has been helping Kashmiris across the country in wake of this attack. A lot of Kashmiri students have approached this helpline all over the country. All Kashmiri children studying outside have been taken care of." Yesterday, in a nearly 20-hour fierce gun battle between terrorists and security forces in Pulwama, three JeM operatives, four Army personnel, including a Major, and a civilian were killed. This incident came after a CRPF convoy, moving from Jammu to Srinagar, was attacked by a suicide bomber in Pulwama's Lethpora area on the national highway on February 14.